As we enter a more environmentally-conscious age, we are inevitably building more ecologically responsible and sustainable cities. Creating buildings with the lowest possible energy consumption and carbon emission production, while still being aesthetically pleasing, is a challenge bringing together great minds to change the way we think about our living and working spaces. Here are some of our favourite sustainable architectural projects coming out of Shanghai, Paris, Dhaka and Barcelona. Shanghai, a wealthy city of 24 million people, has a varied complexity serving as a microcosm that contains a lot of what modern China is all about. 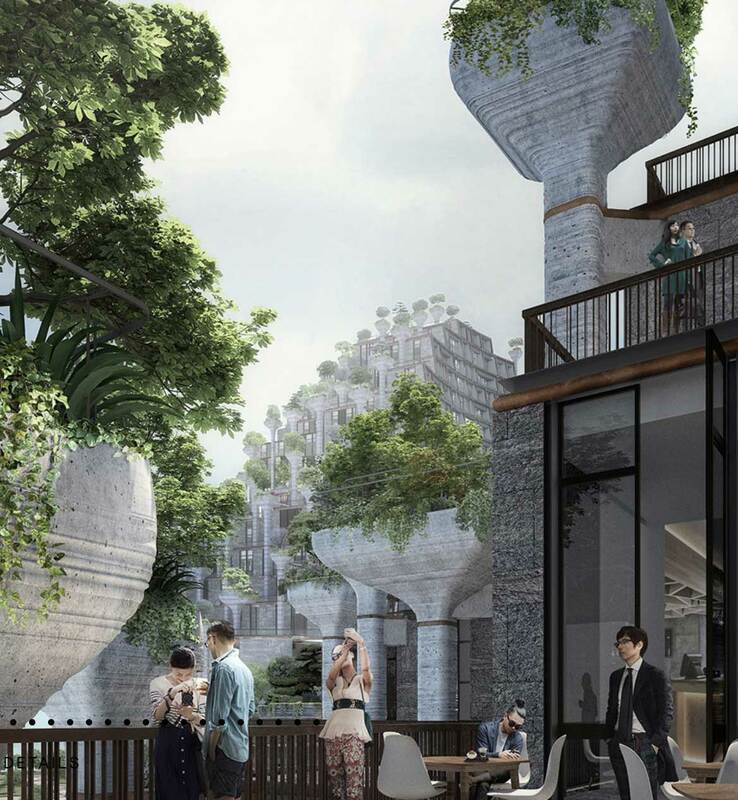 Shanghai is also the city where Thomas Heatherwick is building his ambitious vision with the 100 Trees Complex in Shanghai, an immense project that will cover 300,000 square metres and transcend the mere notion of being just another skyscraper block in the Chinese metropolis. 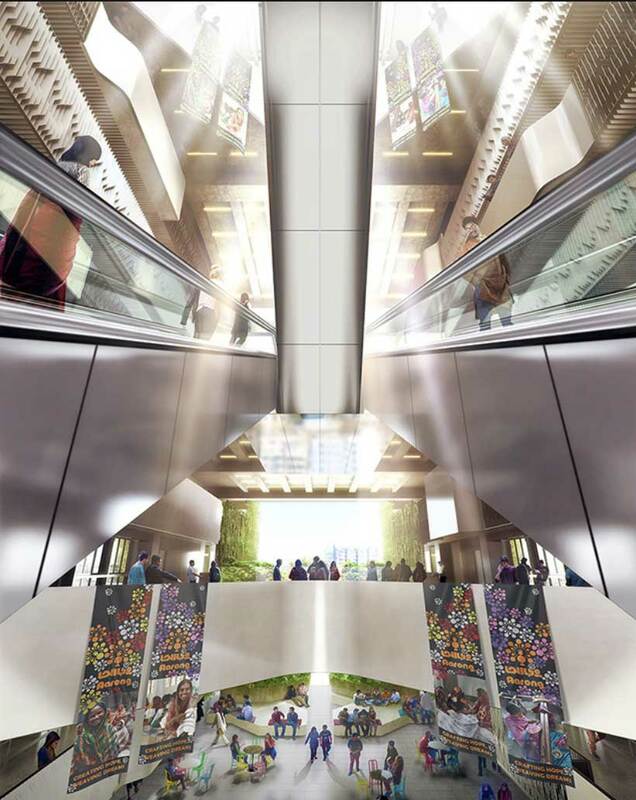 When completed, the building will house schools, residences, retail units, offices and a hotel within its nine floors and three-storey basement. It will also comprise over 400 terraces, many set with plant beds and trees, to enhance the “3D forest” effect and encourage outdoor meetings and recreation. The city’s residents are already calling it their version of the Hanging Gardens of Babylon, and we added it to our to-go list in 2018. France has swathes of vast woodlands, but not a single vertical forest. 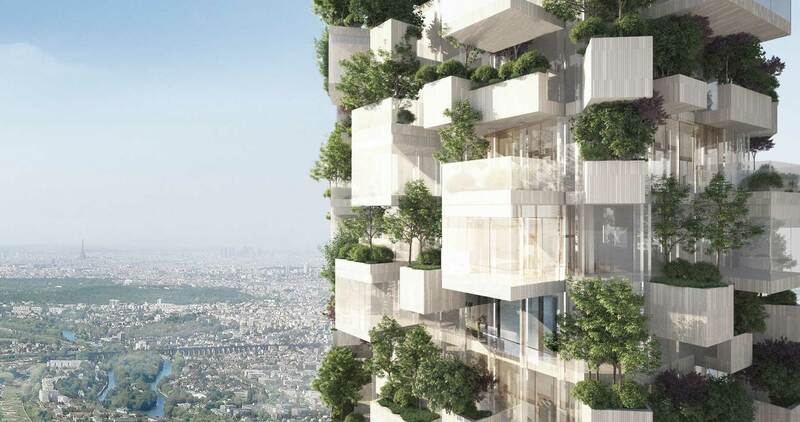 Italian architect Stefano Boeri aims to change this with his Forêt Blanche on the outskirts of Paris, a 54-metre-high tower fashioned from stacked wood and glass cubes with thickly planted edges. The facades of Forêt Blanche will be covered by 2000 trees, shrubs and plants, with a green surface equivalent to a hectare of forest, 10 times the surface area of the lot on which the building sits. Once finished, the site will host residential apartments on the high floors, offices and commercial services in the lower part, with a mix of terraces and balconies on the four sides of the tower. The east and west facing side will allow the passage of sunlight all day, giving natural illumination and ventilation to the apartments and an exceptional panorama on the landscape of central Paris. Amongst the densest megalopolises in the world, Dhaka’s rapid urbanisation has resulted in the displacement of the city’s water bodies, vegetation, open and civic spaces by buildings and industries. 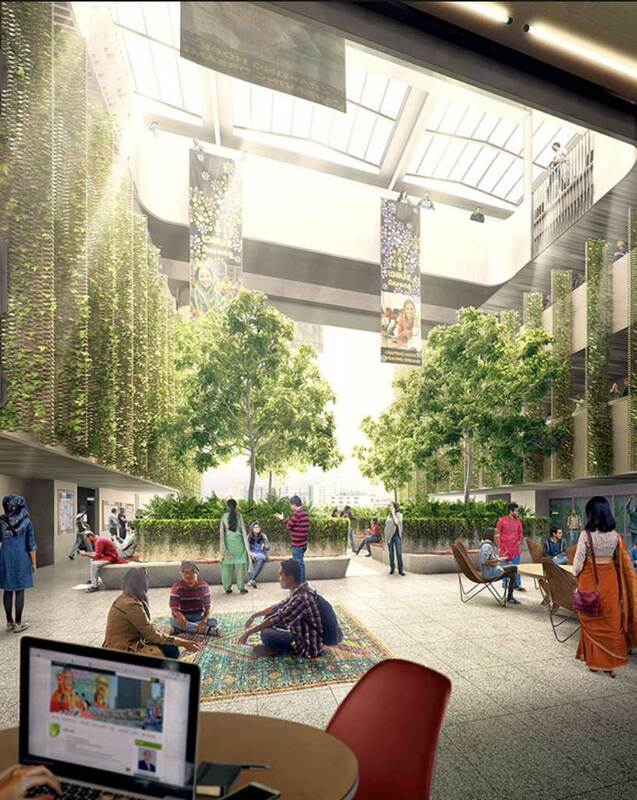 Woha Architects will try to remedy this by building a floating university in the Bangladesh capital. 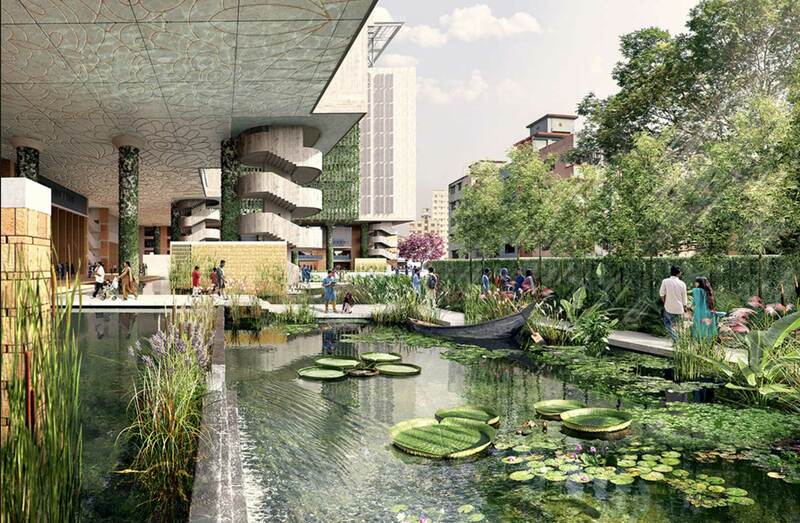 Sited on an urban lake, the vision is to present an innovative and sustainable inner city campus that exemplifies tropical design strategies in response to the hot, humid, monsoon climate of the region while demonstrating the sensitive integration of nature and architecture. Drawing inspiration from the Bengal basin’s Sundarbans mangrove forest that have separate ecosystems above and below tidal level, the design strategy is to create two distinct programmatic strata by floating the Academia above the lake and revealing a Campus Park below, thus reflecting the synergistic coexistence between mankind and mangrove. This approach minimises the building’s footprint over the lake, and further maximises space for facilities while opening up the ground level to activity generating interaction spaces and effective additional park land that creates an imageable milieu for a vibrant campus life. If you have ever visited the Catalan capital, you know how warm, noisy, polluted and busy it gets, especially in summer, when plenty of tourists visit to escape from their routine and catch up on some of the sun and brilliant Catalan atmosphere. The city has already proved its commitment to the environment, wanting now to move away from car hegemony and turn secondary streets into “citizen spaces” for culture, leisure and the community. The administration plans to create several micro projects that merge into green inner-city corridors by moving entire streets underground and banning cars from the centre to create the necessary space for new parks. The city has even purchased industrial land for this goal of creating 108 hectares of new green space up to 2019. To involve the entire community, there are cash prizes for the most sustainable ideas from the citizens.